Click on a result to view the information page for that accession. 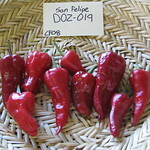 Displaying 1–10 of 23 accessions matching search criteria: Genus is like Capsicum and Distance is within 100 miles of Albuquerque. You have specified a reference location of Albuquerque. 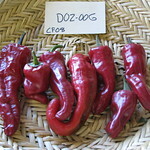 Only varieties with seeds available for distribution are shown. 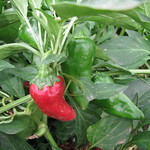 Some plants fuzzy with long, hanging chiles, other plants smooth with shorter chiles that stand up. Medium, increasing to hot after a few seconds. 3-3.5" long. Originally from Santo Domingo Pueblo in northern New Mexico (5,200'). Early-maturing. Medium heat. 3.5-5" long. 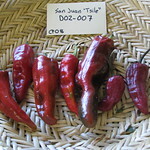 A native New Mexico type chile still grown by elder farmers in San Juan Pueblo. Early-maturing. Mild to medium-hot. 3.5-5" long. 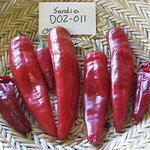 From the farming town at 5,900' in northern New Mexico, famous for its local chile. 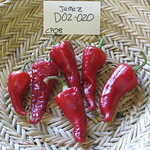 Productive, mild to medium heat, thicker walls than some other land races. 3.5-5" long. 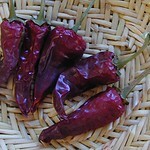 A hot chile, 6-9 inches long, used for rellenos, enchilada sauce and stews. Plants grow around 3 ft in height. Planted in mid-May by many farmers at San Felipe Pueblo. Medium to medium-hot. 3-4" long. From Jemez Pueblo in northern New Mexico at 6,000'. 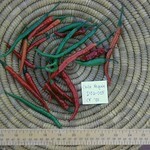 Among the earliest-maturing of New Mexico land-race chiles. Mild to medium- hot. 4-4.5" long. 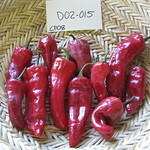 Displaying 1–10 of 23 accessions matching search criteria: Genus is like Capsicum and Distance is within 100 miles of Albuquerque.